YACOUBIAN: OK. As people are taking seats, I want to respect the Council’s request that we always begin on time. Welcome to this evening’s meeting. Our meeting tonight is entitled “What to Do About U.S. Policy Towards Iran After the JCPOA.” My name is Mona Yacoubian and I will be presiding over this evening’s discussion. Before we begin, I wanted to just say a few words about the What to Do About… Series. This is a series that highlights a specific issue and features experts who will provide their potentially competing analyses and policy prescriptions in a mock high-level U.S. government meeting. On behalf of the Council on Foreign Relations, I’d like to thank Richard Plepler and HBO for their generous support of this series. Let me first begin by very briefing introducing our distinguished panel. You have bio details, so I’m going to be just very brief. To my very far right, Ambassador Jim Dobbins is a senior fellow and distinguished chair in diplomacy and security at the RAND Corporation. Next to Jim, Suzanne Maloney is deputy director of the foreign policy program at the Brookings Institution and a senior fellow at the Brookings Center for Middle East Policy. And to my immediate right, Michael Singh is the Lane-Swig fellow and managing director at the Washington Institute for Near East Policy. Please note this meeting will be on the record. So as the principal convening this high-level meeting on U.S. policy toward Iran after the JCPOA, I’m going to start by asking each of you to briefly summarize where we are with respect to Iran, now nearly seven months after President Trump made the decision to withdraw from the Iran nuclear agreement. So let me first turn to you, Mike, and ask you to provide us a summary of where exactly we stand with respect to the U.S. withdrawal from the agreement. What does it entail? Walk us through the various policy steps that have been taken. And remind us, please, what’s the underlying strategy behind the decision to withdraw from the agreement? What’s the goal? SINGH: So, look, I think that we can characterize the Trump administration’s Iran policy as following what it considers its North Korea model. And that is a strategy of maximum pressure against Iran, in this case, along with a sort of bold effort and a bold diplomatic opening, in order to reach what President Trump has characterized as a better deal with the Iranians. Some have characterized the policy in different ways, suspecting that maybe regime change is the underlying objective. But I think if you take the president and senior officials at their word that’s not the objective. In fact, a better deal is the objective. And so what the administration has done, to that end, is it withdrew from the JCPOA and it has re-imposed sanctions. Basically all the sanctions that were lifted or suspended pursuant to the JCPOA in 2016—early 2016. And it has enumerated—Secretary Pompeo in this case—enumerated twelve demands which they would like to see the Iranians meeting in any new deal. And President Trump has, just as he has met with Kim Jong-un, has said that he’d be willing to meet without preconditions with the leader of Iran, the president of Iran, in this case Hassan Rouhani. The way it’s going so far is I think mixed, I would say. What the administration has done, as I said, has re-imposed sanctions in order to generate economic pressure on the regime. That, I would say, has gone well, from the administration’s perspective, because in fact the United States has tremendous unilateral economic and financial power in the world. I think most of us here know that. But still, perhaps, it’s surprising just how effective those sanctions have been. Companies—those companies that actually reengaged in the Iranian economy—and, let’s be clear, that many companies never reengaged in the Iranian economy because they suspected that sanctions might continue to be a problem. Those that has reengaged have largely left. The IMF and World Bank have projected that the consequences for Iran macroeconomically will be severe, the re-imposition of sanctions. And in fact, I think to the Trump administration’s pleasures, they’ve managed to do all of this without a spike in oil prices. In fact, you see oil prices going down. That’s on the economic side. Another thing that I think has gone well, and maybe better than expected, is that Iran has largely continued to adhere to the limits of the JCPOA. And we might talk later on about why Iran has done that, but I won’t go into that here. And so they’ve managed, in a sense, to have their cake and eat it too, because they’re—they’ve re-imposed the pressure on Iran, Iran’s economy is struggling, Iran is really not receiving economic benefits at this stage of the deal, and yet they have not resumed the expansion of their nuclear program, thus far. And that’s a critical addendum to that sentence. What has proven challenging, I think—and this will also take us a bit to where things might be going—is that this has obviously opened up a significant rift between the U.S. and our allies around the world. The United States is relatively isolated in taking this action. 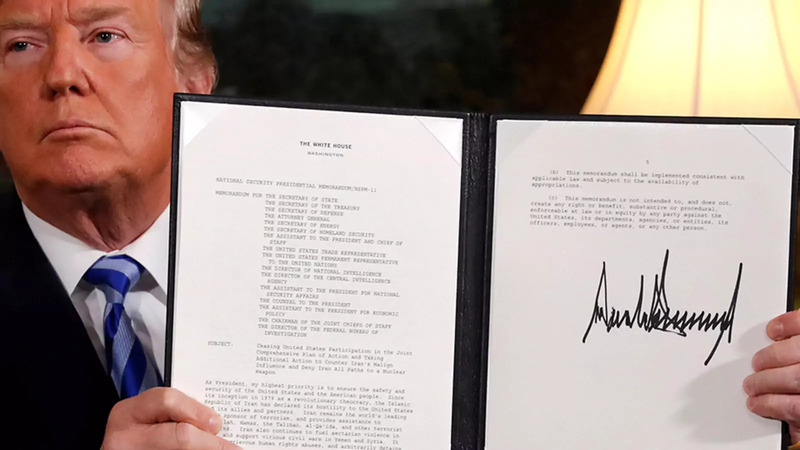 There are a few countries around the world, especially our partners in the Middle East like Israel, Saudi Arabia, the UAE, that applauded the move. But for the most part those other countries looking at the deal and looking at the U.N. Security Council Resolution 2231 that enshrined the deal, have decided to continue to support that resolution and the nuclear agreement and have not supported explicitly at the government level the U.S. re-imposition of sanctions. And in fact, we have seen the Europeans try to find official ways to circumvent the sanctions. That hasn’t been, I think, very effective, and probably won’t be very effective. But it is, I think, relatively unprecedented. It’s not 100 percent unprecedented, as people would tell you. Some minor issues in the past that were similar things. But I would say that this is really the first time we’re trying to erect a secondary sanctions regime in defiance of our allies. When our allies are not just not on board, but they’re actively resisting the United States. YACOUBIAN: And just remind us what happened exactly on November 5. SINGH: What happened on November 5 was the bulk of American sanctions were brought back into force. And these were the most important of them, the oil sanctions and some of the most onerous financial sanctions. But the administration, I think, again, contrary to some expectations, did give wavers on the oil sanctions to certain countries that rely on imports of Iranian oil. They didn’t take as tough a stance on some of the financial issues as people suspected they might. And they were keen, I think—although, this is a bit of a controversial question—to preserve a humanitarian carveout for things like food, and medicine, and so forth. And so it was a bit of a middle course. It wasn’t as harsh as it could be. And I think the result is maybe it’s a first step towards easing that gap that has opened up between the U.S. and our allies. The other thing which is, I think, a big challenge, and I’ll end with this, is that’s the first part of the strategy, pressure. What about getting the Iranians back to the table and negotiating a new deal? On that score, I don’t think there has been any progresses yet, nor is there a clear path to getting there. Just, I think, today, or maybe yesterday, the president of Iran said, you know, the Trump administration has asked eleven times to negotiate and we’ve said no every time. And I think that it will be very difficult to get the Iranians to come back and negotiate in earnest, especially before the presidential elections in 2020. And if there isn’t that kind of reengagement, the question is where does the policy go from there? It’s just pressure. Until you get to that point, there’s always the risk of the Iranians resuming their nuclear program. And so that is an area of, I think, uncertainty at this point. YACOUBIAN: Great. Thank you. Suzanne, so tell us, what has the impact been on this decision inside Iran? What’s been the impact on its economy? What has been the impact on the stability of the regime, on the balance of power between hardliners and moderates? MALONEY: Thanks, Mona. And thank you as well, Mike and Ambassador Dobbins, for the opportunity to sit here and debate the options on Iran. I would like to think that the Trump administration went through a similar—(laughter)—and vigorous interagency debate before the decision was made in May to walk away from the nuclear deal and to lay out the re-imposition of sanctions that we’ve seen take place over the course of the six months that have followed. As Mike said, we really are seeing the effectiveness of American unilateral sanctions. I think there was a real debate among those of us who watch these sorts of mechanisms about to what extent these financial measures could actually have real weight on Iran in the absence of support from the international community. The conventional wisdom, of course, is that sanctions, writ large, are more effectively when they are more broadly supported and imposed. And in this case, because of the sort of centrality of the U.S. dollar and the international financial system, what the Bush administration first experimented with, under Mike and others’ good guidance, and what the Obama administration really perfectly was the ability to cut Iran off from the international financial system, simply by threatening companies and countries with the choice between doing business with or in Iran or doing business with or in the United States. And, of course, for most firms, for most individuals, that really isn’t a choice at all. And these sanctions really are so subtle, in effect, that we have the ability to sort of intimidate firms and individuals who really don’t have a lot of direct exposure here, but at some point the transaction might, in fact, fleetingly, pass through the U.S. financial system. And so in that sense, I think what we’ve seen through the course of the past six months, and really within the moments after the president competed his speech back in May, is that these measures have enormous efficacy, but that there’s quite a bit of muscle memory in the international financial community about the penalties that were imposed during the Bush, and especially during the Obama periods. That there is a recognition that this administration is quite serious about imposing those sanctions in a fairly robust way. And so companies, as Mike said, began running for the hills almost immediately, looking to limit their exposure and their liability. What that’s meant for Iranians is a fairly immediate and direct impact. In many ways, the impact of the sanctions actually preempted the president’s decision. The rial began sliding, the value of the Iranian currency began plummeting early last year and continued that slide. It was accelerated after the president’s announcement. What’s interesting, of course, is that—and we should never forget as we assess where to go from here—the Iranian government has forty years—or, thirty-nine and a half years now—of experience with American financial pressure. We’ve had sanctions in place since November 5, 1979. And so there’s an enormous array of tools that the Iranians have experimented with, have perfected in many cases, with respect to mitigating the impact of sanctions, with evading their imposition, and continuing to do business. And so what we’ve already seen some of that mitigation has begun to take effect. The Iranians have, in fact, stabilized the currency. It’s certainly not back to pre-May levels, but they’ve raised it by about a third from its absolute low this summer. They are managing a series of fairly tough economic shocks, the shortages in domestic consumer products—everything from diapers to tomatoes. They have put in place or are beginning to reimpose some rationing programs to try to ensure that there aren’t these kind of panics at the marketplace. And they are, I think, buckled down to try to ride out for at least as long as they can the economic strains that the country is going to be under. They’re, in fact, boasting, as they have in the past, that these measures enable them to begin to wean themselves off of dependence—or, re-wean themselves off of dependence on energy revenues. And so the forthcoming Iranian budget is only about 25 percent contingent upon oil revenues. And so they see it as a net positive in some respects. But I think there is also a recognition on the part of the leadership—and we’ve seen this play out in terms of the politics. There’s been a number of resignations of impeachments of particularly much of the economic management within the Rouhani administration, replacement of the central bank governor. There is a sense that, in fact, they’re going to have to go back to some very state-dominated policies to try to ride this out that are not really conductive to long-term growth. They recognize that a real siege, if these measures are imposed and, in fact, if the Trump administration, as many anticipate, tries to push for further reductions at the next six-month deadline for assessing the impact of these financial and energy sanctions, that that’s going to become increasingly difficult for them to ride out. And of course, all of this is playing out at a very different political moment than the 2010-2013 period. I think what you have this time is a kind of hangover of political disappointment, which came in the wake of the JCPOA. It really pre-dated the Trump administration and pre-dated this decision. The sense of frustration that there was no sort of peace dividend that was dispersed around the economy, around the country, that there wasn’t the expended bonanza in terms of trade and investment and job creation. And that’s been playing out in a series of fairly small-scale, but widely-dispersed protests over economic issues. You probably saw the headlines last winter, but they really continued and in some places really intensified. We don’t say—I think it’s fair to say these are not a threat to the stability of the system itself, but they have deeply unnerved the leadership because what they have demonstrated is that there is a deep alienation among the core constituency of the—of the system, the lower-middle class, the people who stood to benefit from the change in 1979 and who, in many ways, particularly the post-revolutionary baby boom—are looking and saying: You know, you asked us to wait. You promised us a better life. And it simply hasn’t been delivered. YACOUBIAN: And what about, though, that balance between hardliners and moderates? I mean, has the withdrawal from the JCPOA empowered hardliners in some way, or has it not really had an impact on that internal power balance? MALONEY: I’m a little hesitant to try to go too far into the Kremlinology within the system, because I think in fact what we’ve seen since Rouhani’s election in 2013 is a more consolidated system than probably at any point since the ’79 revolution. And that should be, in many ways, I think, a sort of cautionary tale. Because we all looked in 2009 after the epic unrest in the wake of the contested reelection of Mahmoud Ahmadinejad and said: This regime can’t possibly survive. It’s lost all legitimacy. And within four years, what happened was a sort of closing of the ranks, recognizing at that time that Iran was in a state of real crisis. So I think surely those who advocate diplomacy, those who are interested in reviving the prospects of a negotiated outcome to this standoff, have their work cut out for them under the current circumstances. But in many ways I’m not terribly concerned about the divisions within the system itself. I think the bigger divisions are the divisions between the population, writ large, and the political establishment. YACOUBIAN: Mmm hmm. Jim, so help us understand over the past six, seven months what the impact of this withdrawal from the JCPOA has been in terms of Iran’s behavior in the region, its malign activities in places like Syria, and Yemen, Iraq, Lebanon. Have we seen an impact on Iranian behavior, one way or the other? DOBBINS: I don’t think there’s any detectable change. I think, to the contrary, they probably now see some opportunities with Yemen. I mean, it’s important to recognize that among the four or five civil wars going on in the Middle East, Iran and the U.S. are only on opposite sides of one of them, which is Yemen. We’re not on opposite sides in Iraq. We’re competing for influence in Iraq. And probably the selection of the recent Iraqi government was more a victory for the United States than Iran, in terms of the people who actually emerged. And so you could—you could chalk that up as, like, a marginal gain for us, a loss for Iran in Iraq—influence in Iraq. In Syria, of course, the Iranian-backed Syrian regime continues to advance slowly. And so there, the momentum is still with Iran. And with Yemen, it’s clear that most Americans now hold Saudi Arabia responsible for the human rights disaster, for the perpetuation of the war. And the U.S. Congress is moving to—has already—the administration has already cut off direct support for air refueling. And many in Congress are already voting for bills that would block arms transfers. So I don’t think that there’s any detectable change in Iranian behavior in the region—malign or otherwise. And I think on balance the Iranians don’t see any real degradation in their position in the region. YACOUBIAN: So you—if I’m hearing you, it sounds like you’re saying that the imposition of sanctions, the pull back from the JCPOA has not affected Iran’s calculus. It’s not looking—I mean, there’s some question that whether—I guess the question is, does this economic pressure, can it yield a change in behavior from Iran with respect to, in particular, its behavior in the region? And is it going to find that the pressure it’s under economically from the sanctions that have been laid out, will that result in Iran pulling back from places like Syria? DOBBINS: I think it’s unlikely. I think Iran is—I don’t see a dynamic that produces that. I think the Iranians have refused to respond to the U.S. administration’s overtures for direct contact, largely on the grounds that they’re not prepared to renegotiate the JCPOA, in which they’re supported by all the other signatories of the JCPOA, other than the United States. Whether they would be willing to enter negotiations on Yemen, for instance, or somewhere else, I don’t think that’s impossible. My estimate is that they probably are still wondering whether they have the sort of Kim Jong-un option of just stringing the—you know, talking to the United States, but not agreeing; or agreeing, but not doing anything; and whether they might engage in that. And if they did, then if there was such contacts, then contacts about their behavior in their countries might be—there might be some feasibility areas where there could be some possible convergence. But more likely than on the JCPOA itself, where they’re pretty hardline that they’re not going to give up what commitments they got in that agreement in exchange for the commitments they made. SINGH: Well, this is really an elaboration rather than a disagreement with Jim, because I would say that when—in the past, when the United States has imposed sanctions on Iran, especially for its nuclear program, we’ve actually expected, in a sense, that it would—it could make Iran’s behavior in the region worse rather than better, especially in the short term. And the reason for that is that I suspect that Iran believes that it has a comparative advantage on the ground in the Middle East in many of these areas because they see themselves as more willing to kind of get their hands dirty in some of these places than the United States is, especially now. And I think they also see it as a way of developing leveraging against the United States. So if there is a future diplomatic negotiation or contact of some kind, that they want cards of their own to play. And so I would say that for me it’s more realistic to think that the pressure of the sanctions might cause Iran to come back to the negotiating table and have to talk about these things. I think it’s less realistic to think that pressure alone will somehow deter Iran or somehow cause Iran to cease its regional activities. And in fact, you may get the opposite effect. YACOUBIAN: And, Jim, I want to go back to you for a moment, because one area we haven’t really touched on would be the United States regional allies, with respect to our policies on Iran. And in particular, Israel, Saudi Arabia, and the Emirates. Where do you see them right now, following the decision to withdraw from the JCPOA? Is their support in countering Iran solid? To what extent do we need to be concerned, in particular, with Saudi Arabia and the current controversy surrounding the crown prince? You know, how reliable will these allies be, and/or will we continue to rely on them? DOBBINS: For the JCPOA, yes. YACOUBIAN: For the JCPOA, right. Yeah. DOBBINS: Exactly. I mean, it was. It has become controversial in its own right, quite aside from the Khashoggi murder. And so—and there, that implicates UAE as much as Saudi Arabia. And of course, the Israeli leadership is under some cloud at the moment as well. So Trump’s regional partners all have lost some luster, particularly in this town. YACOUBIAN: Mmm hmm. OK. So I think we’ve gotten a fairly decent level set in terms of where we are today. I think the big question going forward, and I’d like to hear from each of you on this. And so project out over the next six months to a year. Where is—you know, are we on the right track? Is the policy—do you see the policy, as it stands, working? If not, what kinds of course corrections are needed? And in particular, you know, what’s our plan B if, for whatever reason, all of this comes to naught and we see Iran look like it may in fact even being to start resuming its nuclear activities? Where would we go from there? So, Mike. SINGH: It’s a tough question. I think that, as I look at it, there’s two big risks right now for the Trump administration’s strategy going forward. One is that Iran will decide to exit the JCPOA and resume the expansion of its nuclear program. And that could bring on a crisis. And it could be an acute crisis, depending on how fast Iran decides to ramp up its nuclear activities. I think, from my point of view, from a technical perspective, there’s no reason that Iran couldn’t do that quite quickly. The second risk is that nothing happens, that Iran simply tries to wait out the pressure because, as Suzanne said, they’ve got a lot of experience enduring pressure and are not terribly responsive, necessarily, to the concerns of the ordinary people in the country. And they may figure, well, let’s wait to see what happens in the next American presidential election. Let’s maybe even wait beyond that, to see if this policy can really be sustained. And I think that, as you look at this from Tehran, you see certain American liabilities. And I think one liability clearly is the gap between the U.S. and our allies. Another liability is the gap here in Washington, because this is an issue which has become very partisan. And President Trump’s policy has, I would say, little support from the Democratic side of the aisle. And then, third, the U.S.’ clear reluctance to become more engaged on the ground in the region I think is also a liability, because from my point of view there is really only so much you can accomplish through sanctions. One tool will only take you so far. You’re going to need a policy which is far more comprehensive. You’re going to need some answer to what Iran is doing in places like Syria, for example, if you’re really going to put more comprehensive pressure on the regime. I think that what the Trump administration really needs to do is to try to overcome those weaknesses. So it should try, to the extent it can, to reach some kind of modus vivendi with the Europeans. We won’t agree on the JCPOA, but perhaps there is room for agreement on things like Iran’s missile program, where you just had NATO condemn Iran’s missile launch, and some other allies, and Iran’s support for terrorism, where you’ve had these terrorist plots uncovered in Denmark, in France, and other places. I think there might be consensus on the state of human rights in Iran. And so I think there are these points of consensus. And if we can get the Europeans—I would actually say, if we can get ourselves more aligned with our allies, then there is the possibility for the United States to be imposing pressure while our allies try to sort of cajole the Iranians back to the table, using some of these other sources of pressure. YACOUBIAN: So sort of good cop/bad cop routine? SINGH: I don’t want to say good cop/bad cop, but you hit the nail on the head. (Laughter.) So the other thing I think that the administration will have to do, is to try to seek some kind of bipartisan support for this policy. If you do those things, I think that, number one, you have more of a deterrent effect on Iran, because Iran won’t feel as though it can use that kind of wedge between the U.S. and our allies, as a strategic asset for itself. And it may also feel as though the policy might be more sustainable, or more sustained than it suspects right now. Because I think right now they’re banking on the fact that this policy will end with President Trump’s tenure ends. So I do think that these are the kinds of steps the Trump administration will need to take to sort of identify those liabilities. Even then, I do think that we need to perhaps get away from the idea that there is some kind of grand, final solution to this problem—a grand bargain, an agreement, regime change—and maybe accept that this is more of a long-term problem that we’re going to have to practice deterrence, containment of the threat, and so forth, and gear our policies so that they are sustainable over the long term. Now, the good news to me is that many of the policies that you would put in place for—to try to reach a grand bargain are maybe the same types of policies you put in place for a deterrence strategy. But they, again, need to be sustainable over time. I think they need to be the types of things that you don’t need to back away from in six months or one year. YACOUBIAN: Suzanne, what’s your sense? MALONEY: A quick—I agree with everything that Mike has said, but I want to amplify it in a couple of places. In terms of the forecast of where things go, under the current circumstances I think the likelihood is that there will be additional supply—energy supplies that come onto the market in the spring that enables the Trump administration to push for even more significant reductions to Iran’s oil exports, that will in some places conceivably exacerbate some of the frictions with allies and partners around the world. It will certainly result in a higher degree of economic pressure for Iran. And so I see additional vulnerabilities in addition to the ones that Mike has suggested. One is that you have an already—you know, a historically paranoid leadership feeling the pinch even more than ever, both across the world but certainly at home as well. And they will be looking to arrest—you know, as we’ve seen over the course of past few months, environmentalists, civil society activists, journalists, expatriates, dual nationals. They were also be looking to strike back. As I think the attack in Denmark indicated, they’re very skittish about what they believe to be orchestrated conspiracies by the United States and/or its allies, to try to foment unrest within Iran. And so, you know, to the extent that they’re being relatively pragmatic in the way that they approach U.S. forces in the Gulf, for example, for the most part, since the Trump administration came into office, I think they’re going to be less pragmatic and much more determined about trying to take out potential adversaries, even if that means risking additional terrorist activity on European soil or elsewhere around the world. That’s obviously something that none of us want to see. And another vulnerability is just around the oil price, because for the Iranians anything that raises the oil price helps their bottom line, hurts the president’s domestic political prospects at the time when he’s going to be highly focused on a reelection run. President Rouhani said this week, as he’s said many times, this has been the strategic doctrine for Iran since the Iran-Iraq War, that if Tehran can’t export its oil, its neighbors won’t be able to export its oil. I don’t think that they would attempt to, nor could they sustainably, try to close the Straits of Hormuz. But they could certainly take all kinds of action that would disrupt production or export capabilities for their neighbors. So there are a host of vulnerabilities to continuing our current policy, even if on the face of it in terms of the departure of businesses, the economic chaos within Iran, one can deem it a success. And so, like Mike, I think we need to be looking for if not an exit ramp, a sustainable way to redirect the course that we’re on at this time. And I think back to my experience, and Mike probably has a different vantage point on it, during the Bush administration’s second term, and how hard it was, and how hard it took to make the case internally, and then to find a way to make the case externally, for changing the way we though and talked about Iran. At that time there had been for a couple of years a period—the only period in post-revolutionary history—where the United States refused to talk to Tehran. For most of the thirty years that preceded it, it was Tehran that refused to talk to Washington. The Bush administration early on thought no contact was the right way to go, and then progressively realized the nuclear issue was only going to escalate without American leadership and needed to find its way back to the table. It took a while. It took a lot of effort. It took a lot of compromise. Brought us the P5+1. And that’s where I think we need to return again. The one time we’ve been able to if not solve a problem with Iran, at least provide a real fix on a short-term period of time to one of the most urgent issues that was facing the U.S. national security community at the time, the nuclear crisis, was when we were able to create this kind of transatlantic partnership and build upon it to bring in other world powers—Russia and China—in a way that was durable, that was serious, and that forced the Iranians to negotiate in a way that they simply weren’t prepared to do without that kind of consensus. I think that’s obviously exceptionally difficult for this administration to contemplate, but I see almost no prospect that a go-it-alone policy, which is what we have today, is going to succeed. YACOUBIAN: Jim, where do you see things? DOBBINS: Well, I agree. I mean, I think—I think the Iranians probably will bet on regime change in Washington, and therefore stick with the JCPOA for the next two years. I can’t guarantee it, obviously. But I think the midterm elections give them a reasonable hope that there will be a change in administrations and a change in policy in that regard. And they’ll be watching closely our domestic debate, and how the Democrats position themselves on the issue of the JCPOA over this period. I don’t see—I think in Iraq there’s no particular reason why the U.S. and Iran can’t continue to both operate autonomously, but not in direct conflict. And so there’s no particular reason why that situation should get worse or precipitate some crisis in the relationship. Similarly, in Syria we’ve said we’re going to stay as long as the Iranians do. The Iranians are going to stay forever. So it really is a question of how long the United States can sustain a we’re willing to stay forever also policy. And I think that could become more controversial over the next couple of years if there’s no change. I think Yemen does offer some possibility for change, even positive change, because of the revulsion against the war, in this country in particular but more generally in the world, and because of the delegitimization of the Saudi leadership that’s taken place. And so if you were looking for a crack, an opening where there would be sufficient interest on both Tehran and Washington to have a dialogue, not presumably a bilateral one but in some multilateral format, that would seem to be the one where there’s enough dynamism in the situation to allow for it. I don’t see it occurring anywhere else. YACOUBIAN: So very quickly before we turn to members and bring them into the conversation—and this is a hard question to answer in a lightning round, but nonetheless I’m going to—I’m going to ask you all to oblige me. And that is: What’s the wildcard scenario that we are not thinking about? What is either the sort of not catastrophic, but what’s the wildcard scenario of concern or is there something that could really surprise us from a positive perspective that really shifts things dramatically within the span of the current administration? SINGH: Well, I would say all scenarios in the Middle East are scenarios of concern. (Laughter.) It’s one thing I’ve learned in my career. I would point to two things in particular. And I imagine there’s far more, but these are the two that really come to mind. One would be a war in the region between Iran and, say, Israel. You look at what is happening in recent days in the news, with these attack tunnels that have been discovered by Israel, Hezbollah’s efforts to get precision missiles. Israel has been, I think, quite clear that it views these things as a potential casus belli. And you could find a conflict breaking out. Now, if a conflict breaks out, hopefully it would still be relatively limited in duration and in scope. But I don’t think we can count on that, especially now because, obviously, Hezbollah’s arsenal is much more sophisticated and larger than it was in 2006. And Israel has said that its goals would be more expansive than they were in 2006. You could also imagine a regional conflict playing out elsewhere, perhaps between the Saudis and Iranians, but I think it’s the Israel-Iran dynamic that’s most concerning. The other wild card is that, you know, Suzanne had said that the protests in Iran are not a threat to the stability of the regime. It’s one of these things that’s very tough to gauge, where we’ve consistently, frankly, gotten it wrong. I mean, none of us really saw the Arab Spring coming. I’m not sitting here and predicting that there’s going to be instability in Iran. But I think it is the type of scenario that might take us by surprise, if there were real instability in Iran. And that would be a difficult scenario, actually, for the U.S. government to respond to. In a sense, it’s something that the U.S. has hoped for, that there be regime change in Iran. That doesn’t mean that it would be easy or straightforward in terms of U.S. policy. YACOUBIAN: Suzanne, what’s your wild card? MALONEY: I think the most obvious wild card is that the Houthis, at some point, shoot off a missile that actually hits something and kills some civilians—some, conceivably, given the populations of the target sites, conceivably expatriates, including Westerners, Americans or others—that essentially precipitates some kind of escalation and even a U.S. response. I think that’s obviously a very negative wild card, but one—the longer this crisis goes on, the longer this war goes on, it seems almost inevitable. I was going to give the sort of upside, although I don’t think it’s a clear upside wild card, of some kind of sustained unrest that begins to truly fray the seams of the leadership of the Islamic Republic. We are at a stage where succession, only for the second time in the state’s history, is a short-term inevitability. We have reason to believe, from 2009 and other episodes, that while Iran has massive levers of repression that it uses incredibly effectively to its advantage, it’s not entirely clear if a massive nationwide civil disobedience or popular protest movement could in fact be effectively repressed, whether or not the internal security forces would be prepared to fire on large groups, sustained groups of Iranians. And I think, you know, again, as Mike said, we’ve consistently failed to anticipate changes and shifts in Iran’s domestic politics. We’ve always, almost uniformly failed to respond effectively to those changes—(laughs)—even after we realize they’re upon us. And so I think we have to assume that’s not a wild card; something is going to happen internally within Iran, either at a leadership level or around the stability of the state itself, that’s going to surprise us and we’re going to be flat-footed in our response. YACOUBIAN: Jim? What do you think? DOBBINS: Well, I agree with all—what both Mike and Suzanne have said. I do think on the regime change in Iran, we should be cautious about what we ask for. You know, our experience with Iranian revolution—there have been two so far and they both produced regimes that were more repressive than their predecessors. The Middle East had six revolutions in 2012; five of them turned out to be much worse than their predecessors. So the record, both for Iranian regime change and revolutions and Middle East regime change and revolutions, is not one that should encourage you to think that the next Iranian regime is going to be an improvement on the current one. At least in the short term, the force most likely to prevail would be the Revolutionary Guard, which is the most popular element of the regime. And so—well, I think it’s—I think that Iran probably is in a pre-revolutionary state and it’s quite possible that there will be a change in the nature of the regime, one year, two years, five years, don’t know, but the longer you project out, the more likely it becomes. But if we were concerned, if our objective was to get a better regime in Iran, we would be doing exactly the opposite what we’re doing now. We would be inviting Iranian students to visit the United States. We would be opening an embassy. We would be doing all kinds of things designed to make more likely that the next Iranian regime would be more open, more cosmopolitan and more likely to deal with the United States. SINGH: I just want to tack one thing one on the end of this, because I think that one thing we have to think about in this scenario is whether some other power might intervene before the United States does. And I’m thinking here specifically of Russia. There’s this kind of very much a black swan type of scenario but we saw Russia intervene unexpectedly in Syria to prop up the Assad regime. You know, what if that were to occur in a place like Iran? You know, it’s increasingly—as we think about these scenarios in the Middle East, I do think we need to think about other outside actors and the role they’ll play, because, you know, sometimes quietly, sometimes noisily over the past ten years, they’ve become much more prominent players in the conflicts in the region. YACOUBIAN: Well, at this point, I would like to, yes, I see—invite members to join the conversation. Let me remind everyone that this meeting is on the record. When called, please wait for a microphone. Please stand, state your name and affiliation. Please limit yourself to one question—no statements, please, of length—so that we can bring in as many members as possible into the conversation, so. YACOUBIAN: (Laughs.) Yeah, especially for the presider. OK, please, the gentleman here. Thank you. Q: Well, let me start by paying unlimited compliments. (Laughter.) I’m Robert Hunter. I used to have to deal with these things at the NSC a long, long time ago. I appreciate what Michael Singh just said at the end, because it was leading into the question I was going to pose. You mentioned that the—kind of surprising Russian involvement in Syria. I would argue a lot of it came about because of a couple of very bad miscues by the United States: red line on chemicals; whether it was right or wrong not to follow through is another matter; and saying Assad had to go and Assad didn’t go. Russia had a chance to play. Question: As we look at the things that could go wrong for the United States, not only in the region but more broadly, does our—in effect, taking very seriously the interests of local powers, maybe beyond what our own interests are, in some cases—do we open up the whole ball of wax here for Russian and Chinese, maybe some others, stealing a march on us strategically in the area? And does that make us think maybe a different kind of balance of plus and minus, as we think about overall Iran strategy? YACOUBIAN: Do you want to direct that to anyone in particular, or to the entire panel? YACOUBIAN: OK. Well, of course. OK.
YACOUBIAN: (Laughs.) This is really one of the most courteous CFR meetings I think I’ve ever had the—(laughter)—pleasure to attend. Look, there was a time when we worried a lot about external powers and our relations with them in the Middle East. The creation of CENTCOM has a lot to do with worries about the Soviets and the role that they would play in Iran and in the Arab Gulf. We’re not really at that stage now, and I think that now you could say that there are plenty of other external powers, both friendly and unfriendly to us, that have lots of interests in the Middle East. But it would be hard to identify one that has more. Maybe China is heading in that direction in terms of its energy consumption, but China still hangs back quite a bit from Middle Eastern conflicts. I will say, just as a broad point, that I think that is going to increase over time. The involvement of other external powers, especially, frankly, China I would point to more than Russia, because I think Russia’s capabilities are more limited and will be more limited, say, ten years from now. That’s going to increase, and we will start having to think again about what we think about other external powers becoming involved and whether we think that’s a zero-sum equation or whether there’s prospects for cooperation or, frankly, danger of conflict. MALONEY: I don’t have a lot to add other than the—you know, to double down on Mike’s point about Russia versus China and a lot of that, particularly with respect to Iran, just comes back to the history. I mean, the capacity of the Russians to intervene in Iran in the same way they have in Syria I think is almost inconceivable, given the way that Iranians remember that history. And I don’t see any appetite on the part of the Chinese to intervene in either constructive or destructive way in the region. But I think the reality is that this is no longer a sort of unipolar intervention and this is a region that is deeply contingent upon other world powers. And we are no longer the sole and determinative superpower there. DOBBINS: I find it remarkable that we’re more concerned about Iranian presence in Syria than we are about Russian presence. So already we’ve talked to the Russians. We’re hoping the Russians will help us get the Iranians out. We don’t seem to be demanding that the Russians leave. And this is so ahistorical. I mean, the West spent several hundred years trying to keep the Russians out of the Middle East. Now, you never hear—this isn’t an objective. And we’re concerned about the Iranians, this third-rate power that presents no direct threat to the United States. It’s remarkable. YACOUBIAN: OK. Let’s actually go to the back and then we’ll make our way back around. Thank you. Q: Hi. Patrick Theros. I spent a large part of my life in and around that part of the world. One question that—recent news: I think there’s a real likelihood—this wouldn’t be a black swan but maybe a light gray one—that you could have serious instability in Saudi Arabia. How would that affect our ability to implement our policies toward Iran, and what would we do if there was very—you know, civil war in Saudi Arabia broke out? YACOUBIAN: And again, anyone in particular, or the whole panel? Yeah, OK. All right. Let’s—why don’t we start with you, Jim, and we’ll make our way back? DOBBINS: Well, it would certainly shift our interests and perhaps lead to some relaxation of our obsession with Iran, depending on how the Iranians handled it. MALONEY: I think any realistic assessment of the region today would have to incorporate some note of anxiety about the future of Saudi Arabia. There are—there’s a range of opinion about how stable the system is and how coherent the family is. But clearly, this is a—if not unprecedented, quite a different moment and quite a different balance of power within the system and quite a different, again, political context in terms of the demographics and the economics of the country than we’ve seen at any point in contemporary history. And so, you know, I’m not holding my breath for the next revolution in Saudi Arabia, but I do think the question of the stability of the system and the reliability of the Saudis as a partner, or even a cutout for the United States, which is how the Trump administration seems to be determined to use them—realistically, you know, Saudi capabilities are limited to begin with, and so I think the loss of those capabilities wouldn’t impede us, but it would certainly change the perception of American relationships in the region and of American power. SINGH: So I’m going to—on this question I’m going to disagree with Jim, because I don’t think that it would relax our focus on Iran; I think it might actually heighten our focus on Iran. I do think that we are already now seeing a bit of this scenario, because I think there is some internal turbulence inside Saudi Arabia. It’s not such a radical statement. You’re seeing—for a long time, those of us who watch the Middle East really worried about two factors that might destabilize Saudi Arabia: one would be some kind of significant dislocation in the energy market, since it’s so dependent on oil exports; second was this idea of generational succession, from the sort of line of half-brothers down to the next generation. And you certainly are seeing some turbulence accompanying what now is the de facto passing of power from one generation to the next. It’s certainly not severe, it’s not, by any means, civil war, but we’re seeing it perhaps playing out in Saudi regional policies as well as in Saudi Arabia itself. And I think that it’s important to remember in the context of this discussion we’re having about Saudi Arabia and recent events that part of the American kind of interest in having such a strong partnership with Saudi Arabia is defensive in nature. We don’t want to see Saudi Arabia be destabilized because of the implications that might have for the region, which is why we want to have sort of influence and leverage there. I don’t think it would be good for Iran, frankly, if Saudi Arabia was destabilized. I think it would be quite dangerous for the whole region. And I think the U.S. would probably worry that Iran might see it as an opportunity to get involved in any internal instability that was taking place, as they have in other theaters: Iraq, Syria, Yemen, and elsewhere. And that’s why I don’t think it would necessarily decrease our focus on Iran. I think strong, resilient stable allies is actually probably our best asset against Iran because Iran thrives in situations which are destabilized. YACOUBIAN: OK. Yeah, Shireen Hunter, did you—yes. Q: That’s all right. Can you see me? I’m sorry. I have a question but also, if I might, a couple of comments. YACOUBIAN: Very brief. We really like to keep it to questions. Yeah. Q: Very, very brief, because probably more than anybody else in here I have spent my life studying Iran and writing about Iran. And I think that one of the things that to me, particularly of what Michael Singh said, given, really, the fact that I’m also known for being blonde, which hasn’t helped me but, on the other hand, has—in a way is my strength. I think that the scenario that you are saying about dealing Iran and nature of Iran, to begin with it seems to me the perception is based not so much on the regime but really a perception that Iran as a country, culture, whatever is intrinsically imperial and expansionist, whether it is an Iranian empire or it is a Shia Crescent, or whatever. And so, the only alternative that I can see to this is some sort of a dismemberment of Iran and a war will—definitely will arrange that. But on the other hand, this view of Iran is very well known inside Iran. I think that we tend to see our wishes regarding Iran for reality, including that massive uprising. In fact, the more external pressure the Iranian nightmare of foreign powers wanting to dismember it re-emerges and this has been—and a lot of countries in the region—Iran is not just Middle East. If you look at the Caucasus—Mona maybe knows, but if you look, the way the Armenians tremble every time there is talk of invading Iran or excessively pressuring Iran, so I think that actually external pressure is going to bring majority of Iranians together. YACOUBIAN: OK. If you could get to a question, sorry. Thanks. Q: The other thing that I have to say is that we seem to see that there is no defensive element in Iran’s behavior. Yet, if you look at the Middle East’s recently history, it was Iran that was subject of a massive attack, which frankly was green-lighted by the great powers when Iraq invaded Iran. So this is another thing, that almost the perception is that Iran doesn’t have security concerns or that Iran does not face any threats, which still, of course, leaves that there is no room for compromise. But the other thing also is, if the purpose had been really to change Iranian behavior, I would submit, and I will stake my professional reputation on this, that the option of actually engagement and compromise was never sincerely pursued. YACOUBIAN: I really need you to ask a question at this point, please. Q: I am—I am—(inaudible)—President Bush passed away. When he said goodwill will beget goodwill, the next thing that did was, you know, policy of containment of Iraq, which started at the Bush administration. Thank you. YACOUBIAN: I think we’ll—unless anyone has a particular response to this statement, I think I’d rather—I’d rather—let’s move on so we get more discussion. Yes, the back of the room, please. Q: Thanks. Doyle McManus from The Los Angeles Times. Mike Singh quite rightly pointed out that the declared policy of the administration is not regime change but a better deal and suggested that one of the first ways to do that is to find points of consensus with European allies, human rights, ballistic missiles, sunset provision. So two questions: One is, any evidence that the administration is pursuing any of those steps, or is it too early in the timetable of maximum pressure? Second, one contrast with the case of North Korea is that at a quite early stage, almost unremarked, the administration foreswore publicly the aim of regime change. Would that be a necessary condition to getting the track you propose on track. SINGH: Good questions. I’ll say, I think in this case when—my sense is that when the administration’s asked about their aim, they do try to make clear that it’s a better deal is what they’re aiming for. Of course, in the North Korea case there was also the threats of war, so I’m not sure how you kind of square the two situations. In any case, they’re not very comparable. I think that’s important to point out, between Iran and North Korea, and I think you probably agree, Doyle. When it comes to the question of what have they tried to do to make this better deal happen, I think the answer is right now, yes, you have this kind of offer from President Trump at the highest level to sit down with President Rouhani. I’m very skeptical that that will happen because—for many reasons. I think that, unlike Kim Jong-un, who probably saw a summit as a kind of legitimizing step, I don’t think the Iranians see it that way, by any means. And so I think it will be much more difficult in this case. I think the attitude that I sense right now from the administration is that the phase they’re in now is to let pressure work, in a sense, because, remember, one of the criticisms from the right and from critics of the JCPOA of the Obama administration’s approach was that they were too quick, essentially, to make a deal, having put in place this very tough pressure, and didn’t give the pressure time to work. So I suspect that there is this sense that we need to be patient. YACOUBIAN: Suzanne and Jim, do either of you have a comment? MALONEY: Yeah, I mean, you know, I think that, very much as Mike has said, that what—they put out these sort of twelve demands that Secretary Pompeo articulated back in May at the Heritage Foundation and they’ve repeated again; they’re very expansive. When you talk to people in the White House and in the State Department, they take pains to emphasize that in fact they recognize that those demands are not necessarily going to be the outcome and they’re certainly not the precondition to negotiations but that, unlike the Obama administration, they don’t want to effectively negotiate with ourselves and put in a low bid to the Iranians; they want to put in a maximalist bid. The difficulty, of course, is that that maximalist bid makes it—the political pressures within Iran makes it even more difficult to imagine any kind of a meeting. I will say that I am actually more—I don’t know whether it’s—would describe it as optimist—I think the Iranians, you know, are actively talking in the press and within the political establishment about whether there is some way to thread the needle through negotiations. And I think that reflects a recognition on their part that holding out till 2021 is not a good bet for this regime, given the political milestones they have to pass through in terms of elections, which, you know, have no prospect of actual political change but do mobilize people in a way to engage in political participation and political voice in a way that’s, you know, as we saw in 2009, can open up opportunities that this system doesn’t particularly want to empower. And of course, succession looms large, and so I think, in addition to that, this is real pressure; this is real constraint that the regime is under. They’ve got a lot of tools, as I said, to deal with it, but to try to muddle through for two-plus years, and then, only then, you might get a different administration, you might not, and even if you got a Democrat, you might get a Democrat of the ilk of Hillary Clinton, who I think would have been prepared to apply more pressure. There’s really no guarantee that you’re going to have a new president who’s willing to take on a Congress which will always be skeptical of removing sanctions and go forward with some wholly different policy. So I think, you know, there is an active debate within Iran about exactly how to deal with these —with this current set of circumstances. And I wouldn’t rule out the prospect that they—that some kind of negotiation or engagement is part of their own toolkit for trying to manage this crisis. YACOUBIAN: Tom Miller—please stand and name and affiliation, please. Yeah. Just following up on Doyle’s question about North Korea—and I understand, Michael, that the Iranians, the big difference is they don’t need this president to legitimize themselves. But if one looks at what has happened since the meeting in Singapore, the North Koreans are doing all kinds of stuff that we find objectionable, and nothing’s happening. The president doesn’t say anything. And so my question is: Why—and all three of you have said the Iranians follow our situation, our internal political situation, pretty closely—why wouldn’t they take up a conversation with the president, given what has happened with North Korea? I think, you know, if I was in Tehran, I would say there’s nothing to lose other than, you know, some of the hardliners saying you shouldn’t talk to the crazy devils. But, you know, they could do all that they wanted to do if they look at the North Korean situation. So why not? SINGH: I would just point out that there are really key differences between the two situations. I’ll leave it to others to say what the Iranians think about negotiations with the United States, but North Korea had nuclear weapons; Iran doesn’t. And the sort of deal that we reached with the North Koreans for now—although denuclearization remains clearly the goal and what the Trump administration’s hoping for—amounts to a sort of freeze for freeze that we worked out with the North Koreans. There was this kind of crisis looming, with North Korea getting closer to and potentially even somewhat achieving a nuclear-capable ICM capability. There was also really quite severe pressure against the North Koreans in the shape of U.N. Security Council resolutions, and even the Chinese, from what I understand, implementing those resolutions quite strictly. And you have this other issue of the North really, for a long time, having looked for that kind of legitimization that they feel would—felt would come from these types of summit-level talks with the United States. So I think it’s—I think it’s difficult to really put the two situations on par, even though they superficially might look like they’re similar, because these are two nuclear crises, in a sense. The other, of course, you know, X factor there is that in the Middle East, you don’t have anything like China in East Asia. Whenever you talk about North Korea, in a sense, it’s really a question about our larger strategy towards China and towards East Asia in particular. And so, I would just point to those differences and say it’s tough to really spend too much time talking about, you know, the comparisons between the two. YACOUBIAN: Suzanne, and Jim after that? DOBBINS: You know, Zarif, the Iranian foreign minister, tells a story that when—after the JCPOA was signed, his popularity significantly outstripped Soleimani’s. And after the U.S. withdrawal from the JCPOA, Soleimani’s popularity in local opinion polls far outstrips his. And his conclusion to that was that after the JCPOA was signed, the Iranian public on balance supported engagement, and that after U.S. withdrawal from JCPOA they support resistance, not engagement. Now, there’s some self-serving elements to that story, and I tend to agree with Suzanne that this is an option they’re still mulling over. But they have a history of refusing to talk to the United States of, you know, thirty-some years’ duration, which has to be overcome and overcome under extremely adverse circumstances, given the way that their public views Trump and the Trump administration. YACOUBIAN: Suzanne, any thoughts on this? OK, then let’s go right here, please. The gentleman right here, yeah. We have consistently overestimated Iran’s ballistic missile capabilities; for more than a decade we’ve predicted that Iran would test its first ICBM by 2015 and shortly thereafter have the nuclear warheads for it. We also seem to overestimate Iran’s willingness to significantly curtail its ballistic missile program. And my question is, what’s in it for Iran to remove the only weapons it can use to reach its two principal enemies in the Middle East? YACOUBIAN: Who wants to take a stab at that? SINGH: I mean, look, I think that, Greg, the bottom line is Iran has a significant missile arsenal, these medium- and short-range missiles. And there’s no doubt that Iran considers that to be one of its strategic assets. I think that the U.S. has really three concerns, which to me are all totally valid concerns. One is what we’ve seen recently: the worry about the destabilizing risk of missile tests and the kind of, any advancements you might see in the capability of those missiles, in terms of—I’m not an expert and you are, but the types of warheads they can carry, and so on and so forth. The second concern is the proliferation of those missiles, because what Iran has tended to do is to develop missiles and then not just keep them for themselves as a defensive measure but proliferate them to allies like Hezbollah and to, an extent now, the Houthis, and so on and so forth. And it’s that proliferation which is in a way even more dangerous than Iran’s possession of those missiles. And then the third element is the ICBMs. And I think you’re right; you know, the predictions about the timelines for Iran’s ICBM development have been wrong. But I will say, sort of in defense of the IC analysts who come up with these predictions, it’s in part because we’ve heard the predictions and we try to take policy actions to stop them from procuring the assistance they would need to get ICBMs, because my impression is that those predictions often tacked on the phrase “with foreign assistance,” usually. And we have tried very hard, both Republican and Democratic administrations, to engage in counterproliferation measures that would make it difficult for Iran to obtain what they need to have an ICBM and also to deter them from doing it by making clear what our reaction would be if they had an ICBM. I mean, there’s no doubt in my mind that this would be an incredibly destabilizing step, if Iran were to move in that direction. So again, these to me are all totally valid concerns. I mean, the missile question, I think, you can’t treat with a broad brush, but you need to break it down into those individual threats that we face. YACOUBIAN: Other comments on this question? DOBBINS: You know, I mean, American policy for successive administrations is that Israel should have a military edge in the region. Iranian long-range missiles erode Israel’s military edge. It’s almost as simple as that, in terms of American policy. YACOUBIAN: Let’s see, let’s go back here. Yeah. Q: Hi. I’m Richard Johnson with the Nuclear Threat Initiative, formerly running the office at the State Department that was implementing the JCPOA. So a question for you, for the panel: Recognizing that the Pompeo twelve demands are essentially a demand for capitulation on the part of Iran and not really a starting point for negotiations, and also recognizing that, despite what the panel says, that the administration is interested in a new deal, that in fact they walked away from negotiations with the E-3 that would have dealt with some of these questions, I’d like to get to the reality of what we think an actual, realistic approach could be to get back to negotiations and what the actual set of issues could be, because it seems as though this was tried and either not pursued in good faith or failed. And the last comment or question I’ll have on that is, this panel is titled “U.S. Policy Towards Iran After the JCPOA,” but of course, the rest of the participants in the JCPOA think the JCPOA is still in place. Q: So could I ask, is there any potential for the U.S. to return to the JCPOA, and if so, in what form and with what modifications? Thank you. SINGH: I’ll be very quick. SINGH: I think that I disagree with your characterization of the Pompeo twelve demands. I think that yes, there’s twelve of them, but they’re not so different from what President Obama used to say in his first term about what he was looking for from Iran and, frankly, not so different from the type of grand-bargain discussions that the Iranians brought to the United States in the early part of the 2000s, when the United States would rebuff these ideas, because we weren’t in favor of that sort of thing. You remember the 2003 fax, which the United States was always criticized for dismissing, was also a purported offer to deal with a lot of these different issues. These are the issues that exist between the United States and Iran, and I think that the question for negotiators past and present and future is, is it better to seek the type of deal that President Obama sought, which is you take one issue and you try to take it off the table and set the stage for further negotiations, or is that not tenable, and do you need to actually solve all the issues in one grand bargain; or, third, is it actually not possible to do any of this through a formal agreement, and instead you need to reach kind of an implicit deterrence or something like that in the region? I’m mostly in the third camp myself; I’ll tell you that. I am of the view that the JCPOA and agreements like it wouldn’t be sustainable over time, even if the U.S. or some other party didn’t withdraw, because it’s based upon the premise that you can isolate that issue, lift sanctions on that one issue, while continuing to engage in hostilities across the board on other issues. I think that maybe is true between two powers that are relative peers, like the U.S. and another superpower. I think it’s much harder when you have the immense power disparity that you have with the U.S. and Iran, for the United States to say, we’re going to hold back on our most effective nonmilitary tools to counter all this other behavior because we’ve agreed in this one area. That’s just an analytical judgment on my part. I don’t know if that’s why the Trump administration’s taking the approach they are or if it’s something else, some other judgment they’ve reached. But clearly, Obama administration had a very different take on that issue. In the Bush administration, we always used to say that we need to see a strategic shift by Iran before you can have any real hope of a sustainable deal. When the next administration comes back—just very briefly—my own view is it will be difficult for any American president simply to step back into the JCPOA as it is, because by that time you’ll be much closer to the sunsets; a lot will have transpired; you’ll have all these sanctions back in place. And I really think you’re going to have to start almost from scratch, regardless of what your ultimate intention is. MALONEY: —because it puts these larger issues on the table. And I come out somewhere similar to Mike, which I think is notable because I’m not sure, but I believe you were not a fan of the original deal or supporter of the deal, and I was. SINGH: I was a critic of it, yes. MALONEY: But I think, you know, the experience not really even of the Trump administration but of everything that preceded it, suggested that there were real problems with the transactional approach to solving problems with Iran. And I say that as a long-term skeptic of any prospect of a grand bargain or even of the validity of the purported facts in 2003. But I do think, you know, the experience that we saw of Iranians being deeply frustrated with the extent to which sanctions relief was incomplete, as wholly appreciated by the negotiating parties, but certainly not in the way that the deal was sold to the Iranian public, was a huge vulnerability in sustaining it over the long term. And from our end, as Mike said, the extent to which there was this concern about keeping the Iranians in the deal that led Secretary Kerry and others within the Obama administration to briefly become champions for other countries doing business with Iran, this sort of awkward scenario in which we were actually lobbying against our own companies was also really problematic, because it didn’t enable us to do what President Obama sold the deal here as doing: solving, or at least temporarily deferring one urgent concern, while we continued to manage, through pressure, through other—all the tools of national security, all the other difficulties that we have with Iran. And frankly, I come back to the realization that my good friend and Iranian-American citizen, Siamak Namazi, was detained on the very deal that—the very day the deal was concluded. And we had limited—we have always limited tools to deal with those sorts of issues. They became more limited at a time where we were trying to essentially appease and conciliate the Iranian leadership on the presumption that if we didn’t, they would walk away from the deal. So I think there are real flaws around transactional approach. I think there are, you know, almost insurmountable, inconceivable difficulties under the current political circumstances with the transformational approach, with the grand-bargain approach. But, you know, if pressed—(laughs)—that’s the approach I’d prefer. I think managing the problem, the sort of anti-solutionism that a friend of mine, a colleague of mine has written about with respect to Israeli policy toward the Palestinian situation, may be the only option available to any American administration, so long as this regime remains in place within Iran. And let me just revert back to your central premise, how much this administration really, current administration really wants a new deal. I genuinely believe, and maybe it’s putting too much credence in his tweets—I think the president, you know, sees himself as a deal maker. He’s the author of The Art of the Deal. He really does, I think, have the sense, and he campaigned in a way, at a time where all his Republican rivals were only talking about ripping it up. He really does want to get across the table with Iranians. His national security bureaucracy, particularly his national security adviser, may not see that in the same sense, but I think that, you know, what—the actions that they’ve taken, the president apparently believed that he had to start fresh before he could get a better deal, and so that was the premise under which they walked away from the JCPOA. Whether I like that or not is water under the bridge, and wherever we go from here we have to start from that point. YACOUBIAN: Jim, I’m going to give the final word to you. DOBBINS: Well, I think as a matter of law, constitutional practice, there’s nothing that would hinder the next president from going back to the JCPOA. Congress was consulted when the agreement was concluded, in a rather backhanded way. It wasn’t consulted when we left. I think its original consent, to the extent it gave its consent, remains on the record. And the president can simply go back. Now, will he do that? He would unlikely do that, except in the framework of a broader, articulated policy toward Iran, towards the region. And I think it’s very difficult to say two years out what will our relations with Saudi Arabia look like, what the region will look like, what will be going on in Syria. So I think it’s a viable option. I think that the Democratic candidate is going to have to articulate a position on that. It won’t be a major issue in the election, but it’s the kind of thing where he’ll have to have a position. And it probably will be a position that will be closer to what Obama’s was, that is, a willingness to engage and, under some conditions, at least, to go back to the agreement.